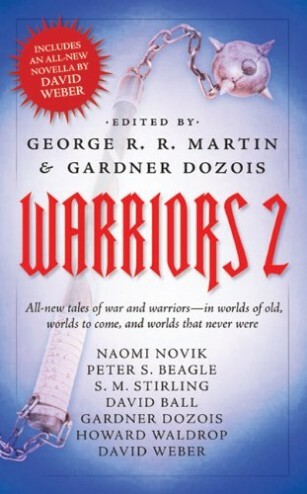 A couple of weeks ago I came across a copy of the second Warriors anthology. 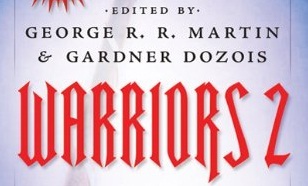 George R. R. Martin and Gardner Dozois edited this tome, with the latter including a story within the volume. The book promises “long form stories of war and warriors from some of the most compelling storytellers now writing.” Rather than writing individual posts for each story, I thought I’d try my hand at writing an ultra-pithy review for each offering. Novik’s story reads like James Cameron’s Avatar. The story’s protagonist is a diplomat for a Terran based interplanetary alliance. The first person narrative sees this character correcting the history that has arisen around her due to her role in a war between an indigenous culture and an industrialized colonizing force. Naturally, the indigenous population is more advanced than anybody ever suspected. As a student of history, I couldn’t get past the clichés to really enjoy this story. Those who don’t use/hear words like “agency”, “genocide”, “biopolitics”, and “colonialism” on a regular basis are more likely to engage with this narrative. Beagle’s entry begins with some free verse poetry that almost made me skip the entire story. Once he shifts into prose things get more interesting, but not necessarily more comprehensible. An entity that is corporeal but spirit-like finds herself constantly teleported to the scenes of looming tragedy. In each successive event she prevents a given horror of urban life: assault, murder, neglect, emotional abuse, et cetera. The ending is open to some speculation. However, what’s clear is that this spirit encompasses one person’s desire to do more. It’s moving if nothing else. Ancient Ways is an original story set within Stirling’s “Emberverse.” The problem here is that there’s not much to enjoy in this story if, like me, you didn’t like Dies the Fire and its follow-up books. Truth be told, I find the concept of “the change” – a supernatural event that reduces modern Earth to a pre-industrial society – to be a lazy way to get around actually destroying the world. Because of that, I couldn’t engage with this story set on the Russian Steppe. To its credit, the descriptions of the ethnic groups which make up that region of the world are remarkably accurate. Likely a great read for current Stirling fans, but nothing that changed my opinion of this particular world. Ball’s story, set in 17th century Morocco, is one of psychological torment. The protagonist, Baptiste, is a French army engineer who is captive to a capricious Moroccan king. It is a story of determinism and cruelty as Baptiste’s fate hinges not upon the tyrant himself, but a mysterious and prophetic scroll. The events of the story orbit a single question, “Will you kill for me, Engineer?” At the crux of that question is a moral dilemma between actively killing and allowing others to die through inaction. The evocative language invites readers to measure their own moral fortitude against the horrors of Morocco’s dungeons. There’s an inescapable mythological allegory in play within Dozois’ story of humanity’s futile resistance against artificial intelligence. These AIs are akin to the gods of old, toying with people as objects of curiosity. The story paints an amazing canvas that elevates AIs to a point where they become extra-dimensional beings. If only the narrative were as developed as the world, then this story might have been my favourite of the anthology. So much time is given over to world building that I suspect this is simply an excerpt of a much larger work. I liked it, but the actual story is very underdeveloped. The beauty of this story isn’t so much that it is a well crafted alternate history, but that it exists as a plausible lost chapter from the First World War. Buried under the static trench lines of the Western Front, an international resistance group plots to end the suffering that comes with nationalism and war personified. Their tools in this mission: Esperanto and the recognition that the fighting man is not an automaton. In truth, I never would have thought that a failed universal language would work as a narrative device. Waldrop’s story simultaneously embraces pre-1914 idealism while rejecting its arrogance. A theme of war as the enemy of universality should resonate with all contemporary readers. Judge me if you will, but I liked this story. It’s not the best of the anthology, and in typical Weber fashion it says in 30,000 words what could be said in 20,000. In this particular alien invasion scenario, the entirety of the Earth becomes a Balkans. Orbital strikes destroy the planet’s major cities, but pacifying the rest of humanity proves harder than the occupying forces expected. Readers will likely find the story’s ending to be completely polarizing as it blends an effective alien invasion scenario with a deus ex machine that is lifted directly out of gothic literature. Despite being a one-off, the story possesses the exacting detail that is the hallmark of David Weber’s writing. Final Judgement: This anthology offers more hits than misses. At a $10 price point, if you buy it new, I’d say Warriors 2 is a fine investment of time and money.